A Possible Detection of Dark Matter in a Dwarf Galaxy! These observations indicate that there is much more mass in the universe than we can see with light. But these gravitational clues are only “indirect evidence” for dark matter’s existence. It is like seeing a dancing marionette puppet (the gravitational effects), and inferring there must be strings (dark matter) to make it move. Some models (such as Modified Newtonian Dynamics) try to explain these gravitational effects through a subtle change to General Relativity. These changes could make gravity stronger in certain places without requiring more mass. This explanation is like saying the puppet is held up by magnets: it could explain the puppet’s movement just as well as strings could. To prove dark matter really exists, we must actually see the strings, not just the puppet. Today’s paper offers some of the best evidence yet! In order to conclusively prove the existence of dark matter, astronomers and physicists alike want so-called “direct evidence”: a unique measurement of a new particle, using some property other than gravity. Astrobites has previously covered many examples of ways to directly detect dark matter (assuming the particles are something like a WIMP). The most direct detection method is with particle detectors buried underground. 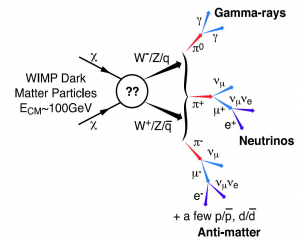 Another direct method is to detect gamma-rays or radio waves emitted when two dark matter particles collide (Fig. 2). Fig. 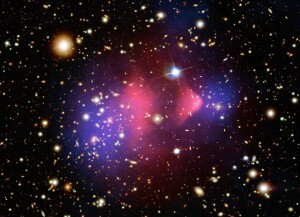 2 – Dark matter particles probably don’t produce photons on their own. However, if they interact via the weak nuclear force, they could create a particle-antiparticle pair when they collide. These byproducts can produce gamma-rays, neutrinos, etc., resulting in observable traces of dark matter. From Baltz et al. 2008. Because dark matter particles don’t interact with light, they shouldn’t produce photons on their own when they collide. However, some models predict they could create a particle-antiparticle pair, like a tauon and an antitauon. 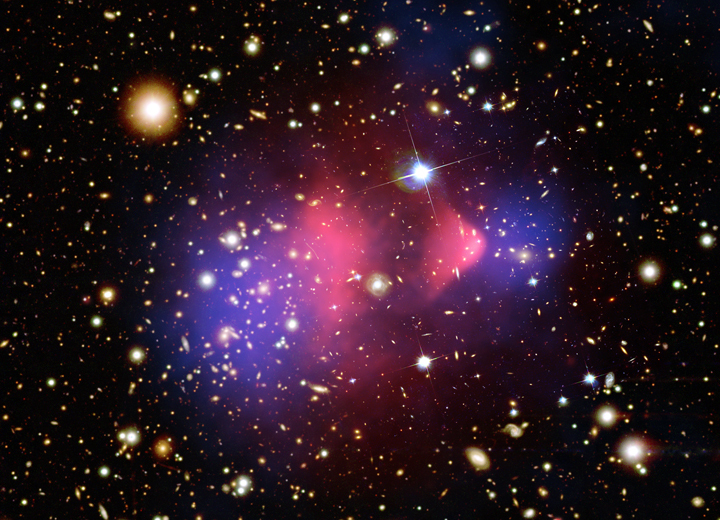 These byproducts of the dark matter collision can then collide again, resulting in gamma-rays. They could also spiral around galactic magnetic fields, producing radio waves. This method is less direct than actually seeing a collision in a particle detector. But, it would be much more conclusive evidence for dark matter than the gravitational effects alone. The best place to look for the emission from colliding dark matter particles is where dark matter is thought to be the most dense: the centers of galaxies and clusters. Observers claim to be very close to detecting gamma-rays coming from dark matter at the center of the Milky Way (see this Astrobite). But while large galaxies like the Milky Way should have a lot of dark matter, they also have a lot of background gamma-ray sources! Pulsars, supernova remnants, and our supermassive black hole all emit gamma rays like crazy, and are all clustered right near the center of the Milky Way. So even a strong dark matter signal could be tough to distinguish from the regular gamma-ray emission from the galaxy. Therefore, dwarf galaxies are thought to offer one of the best ways of detecting dark matter, if it actually emits gamma-rays at all. Previous attempts to observe gamma-rays coming from dwarf galaxies have been marginally unsuccessful (see this Astrobite). The authors of today’s paper analyzed archival measurements from the Fermi-LAT gamma-ray space telescope, looking for emission from the dwarf galaxy Reticulum 2. They estimate the expected background in two ways: one from the Fermi group’s model of diffuse emission in that region, and one from actual measurements, averaged in the regions around Reticulum 2. Fig. 3 – The gamma-ray spectrum around Reticulum 2 is shown in red points. Two different background estimates are shown as the solid black line and grey triangles. The excess of emission around 2-10 GeV could be the first signs of direct evidence for dark matter. Fig. 1 from Geringer-Sameth et. al 2015. 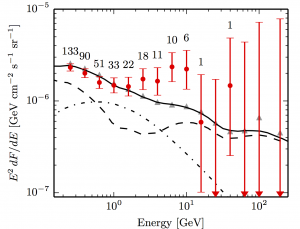 In an exciting breakthrough, the authors find more gamma-ray flux than expected from either background model! 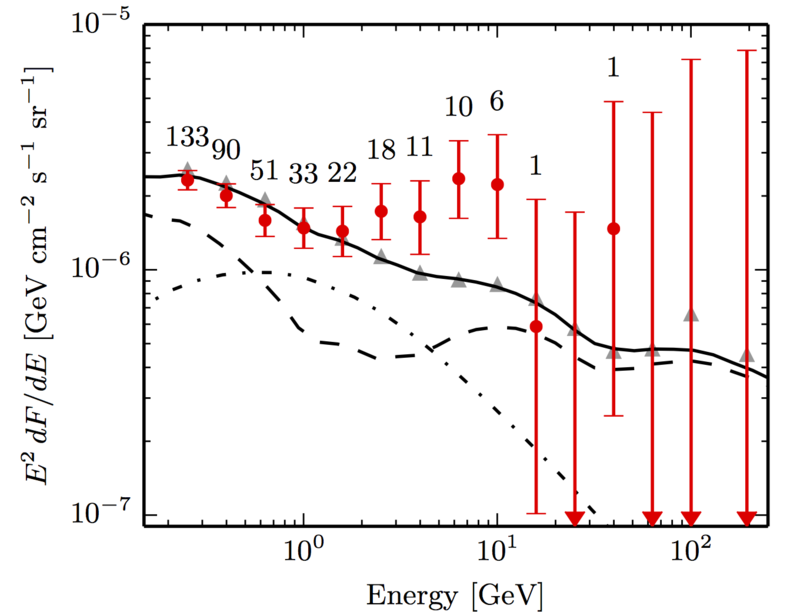 This emission is observed to come from gamma-rays between 2–10 GeV (Fig. 3). If this emission comes from dark matter collisions — rather than some other source that hasn’t been identified yet — this energy range could help constrain the mass of the dark matter particles themselves. The authors claim this to be a significant detection of dark matter. Values as high as 4σ are tossed around, suggesting less than a one-in-ten-thousand chance that this is just noise. This exciting result has been getting lots of press attention over the past week (such as in this Brown University press release, this Discovery article, and even the New York Times). However, these significance levels are dependent on the models chosen for both background emission and for the dark matter particle physics. In this Astrobiter’s opinion, the most that can be confirmed is the detection of an excess of gamma-rays from Reticulum 2. The authors themselves stress that there is a lot more work ahead to confirm this emission indeed comes from dark matter. More observations of this galaxy in gamma-rays are needed, to improve the quality of the signal. The Fermi group is soon releasing a new data reduction algorithm, which will improve the resolution of the observations already completed. Perhaps even more importantly will be follow-up in other bands, like in optical or X-rays. These can identify whether another source which could produce gamma-rays (like a pulsar or a young, massive star) is nearby to this galaxy. Dark matter has not yet been conclusively detected, but these observations indicate we might be very close. It is unquestionable that this object (and other dwarf galaxies like it) will be getting a lot of attention in the years to come. How do researchers intend to prove that these gamma rays do not have another source? When these extra gamma rays are observed, are they significantly different from the spectra we observe from gamma ray bursts? One of the best ways to show this is to make observations in other wavelengths (optical, radio, etc.). If the gamma rays are coming from something else (a black hole, neutron star, etc) then the source should show up in other images. Gamma ray bursts can be easily ruled out, because they are very transient (or short-lived) events. Most GRBs emit gamma rays only for a few seconds to minutes, so we can be sure that a GRB is not to blame for these gamma rays. Is similar archival data available for other prospective dwarf galaxies? Are there any studies examining them currently? Yes! In fact, the paper referenced here includes a brief analysis of other recently discovered dwarf galaxies. Reticulum 2 has the strongest signal yet observed, likely due to it’s coincidental location in a region with low background emission. I’d be interested to see if other independent astronomers are able to replicate their findings. One clarification worth pointing out that the Fermi collaboration has not found significant evidence for an excess in any of the DES candidate galaxies (http://arxiv.org/abs/1503.02632). These reports are from people external to the collaboration. That’s very interesting! One thing I notice is that the Fermi paper only makes use of observations through August 2014, while the paper this post references includes another 6-months of time, up to February 2015. Assuming that this region of the sky was measured during that time, perhaps that could explain the increase in signal? It is amazing how little we know about our universe! About dark matter, how can we expect it to be composed of the same particles when it does not interact with light? I mean, is not it a suggestion that black matter is composed of completely different particles and sub-particles? There is, of course, no reason that dark matter MUST interact in this way. It is simply a prediction of a class of models, known as the “WIMP model”, which says that there could be particles which interact via gravity and the weak force, but no through electromagnetism. In this model, when the particles collide they can create ripples in the quantum field, generating particles/antiparticles, even though they are not necessarily MADE of those particles. The 4σ significance level is impressive, but as you note, it depends on the models chosen. How greatly does this significance level vary when using a different model? Is it still significant enough to be a promising lead in the detection of dark matter by more direct means? If you’re interested in this topic, I would check out Figure 2 of the original paper. There, they show the “detection significance” if different models and DM-particle masses are assumed. My skepticism comes from the wide range of possible models that are all “significantly detected”. If it is impossible to distinguish between all of these many models, then it is unfair to say that any one of them is confirmed. Instead, maybe better to just say that “something” has been detected, and wait for better observations before claiming with what significance. They mention that this could constrain the mass of the particles, are these findings really that sensitive or is the goal actually more limited to detecting direct evidence of dark matter with possible future research directed at particle mass? Figure 2 of the original paper gives a sense of how well this mass is constrained. It may seem like very little constraint at all (it could be anything from 10 – 1000 GeV) but compared to the huge theoretical range the particle COULD take on, it’s a good start. 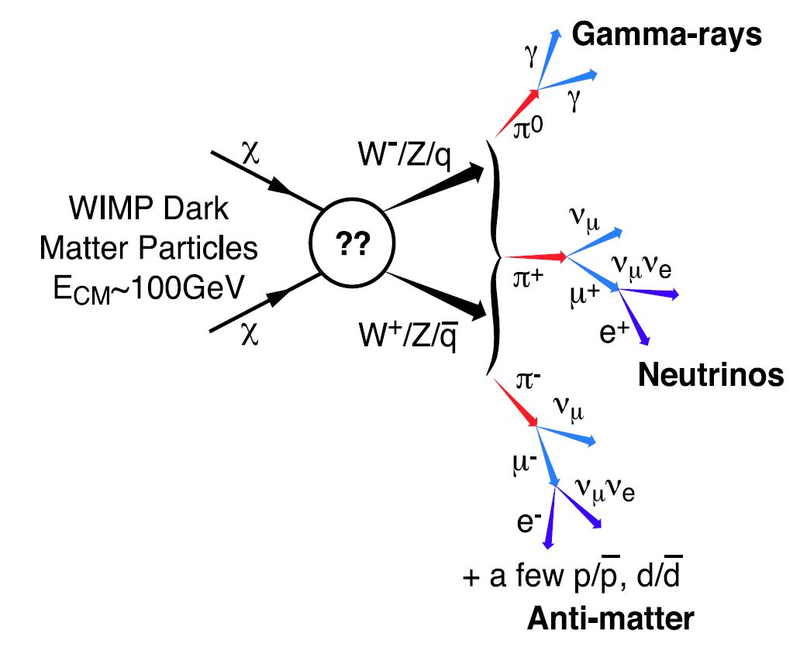 The main difficulty is that constraining this particle mass depends a lot on which model is chosen, and what intermediate particles are thought to cause the gamma ray emission. Thanks for your post! It’ll certainly be disappointing if the follow-up research you mention indicates that these gamma rays could’ve come from another nearby search. Are gamma rays the only frequency/wavelength emitted during potential dark matter collision-byproduct’s collisions? I imagine it being possible to constrain further if a similar pattern was detected in another band, allowing the elimination of certain astrophysical bodies. What frequency of emission is released depends on the mass of the dark matter particle, but most models predict emission primarily from gamma rays. Because of this, finding NO signal in any other wavelengths would actually be a better sign of dark matter than anything else, because most other gamma ray sources (black holes, neutron stars, etc) will have some other detectable emission. This would be incredible if the “extraneous” gamma-rays proved to be produced by dark matter! Fingers crossed the their study checks out! It’s interesting that we have evidence from dwarf galaxies. Isn’t the cusp-core problem worse for dwarf-galaxies than for normal galaxies? If we interpret this signal as a dark matter signal, would this have anything to say about the cusp-core problem?